It is the middle of the summer, so in many gardens one can see (and smell) the barbecue. It seems to be a very good occasion to have a closer look on the depictions of a saint, who is always shown with a gridiron. 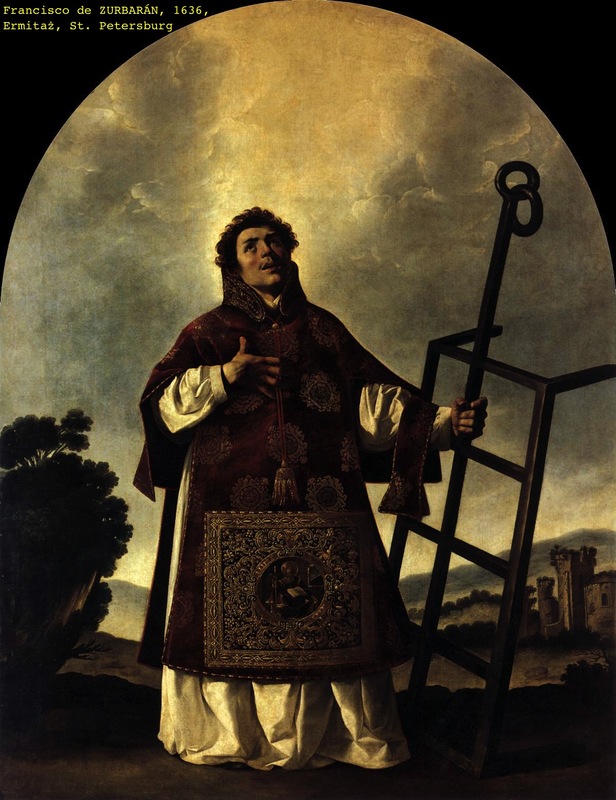 It is Saint Lawrence, an Early Christian deacon and a martyr. As usually in a case of such saints, there’s almost no certain information about him. 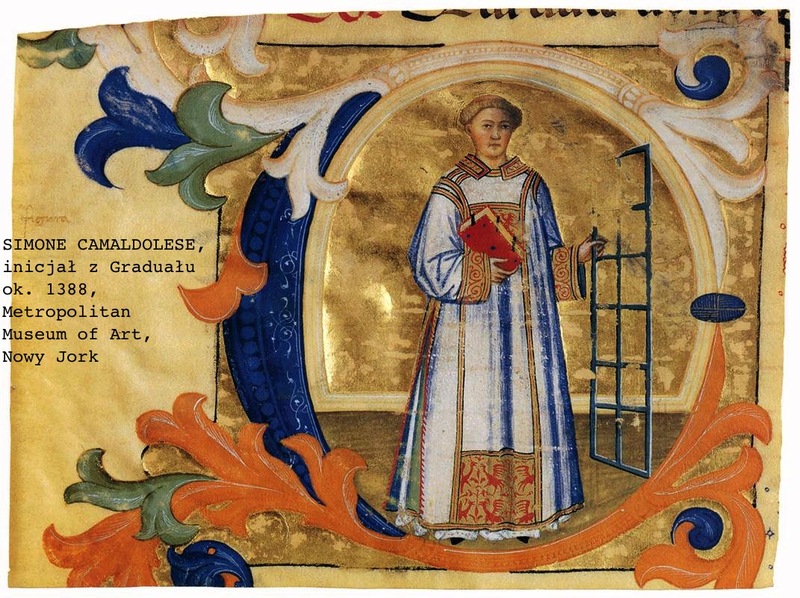 It is just assumed that he was one of the deacons of ancient Rome under Pope Sixtus II that were martyred during the persecution of Emperor Valerian in 258. Of course, later the legends were created and all the gaps in Lawrence’s biography were filled in with new details. So, it was said that Lawrence have been born in Spain and later became a deacon in Rome, where the Pope Sixtus II ordered him to look after the treasure of the Church. That is why the prefect of Rome decided not to kill Saint Lawrence with the Pope, but demanded that he turn over the riches of the Church first and gave him few days to collect them. That is when Saint Lawrence managed to spirit away the chalice used during Christ’s Last Supper (the “Holy Grail”) to Spain. Later he presented to the prefect the poor, the crippled, the blind and the suffering, and said these were the true treasures of the Church. That of course angered the emperor and Saint Lawrence was sent to death. Early Christian martyrs were in fact quite difficult to kill. According to the legends they managed to survive many tortures and sometimes it was necessary to execute them repeatedly until they finally died. Saint Lawrence was supposed to be flagellated and his arms and legs were twisted off his joints, but finally he was placed on the gridiron and burned alive. 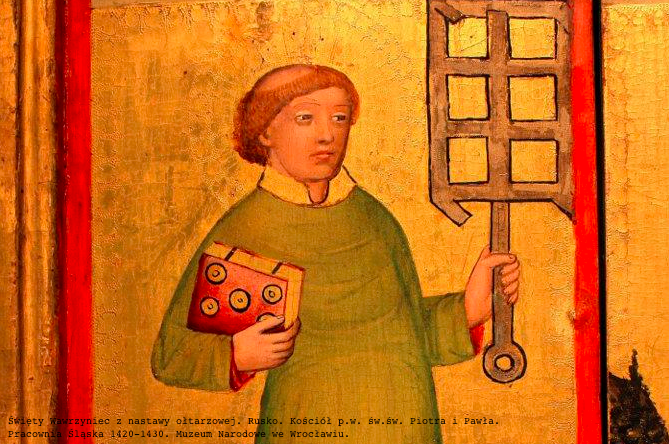 That is why he has been depicted with the gridiron: the device he was tortured with became his attribute, as in the case of almost all of the holy martyrs. But we must remember that the description of his death is purely legendary; in fact it might have actually started with a misspell. It is possible that it all started with the accidental omission of the letter “p” in the note announcing the death of a martyr passus est (“he suffered,” meaning he was martyred], so it was made to read assus est (he was roasted). And later legend expanded the story. Of course there are also the depiction of Saint Lawrence in the process of being martyred. 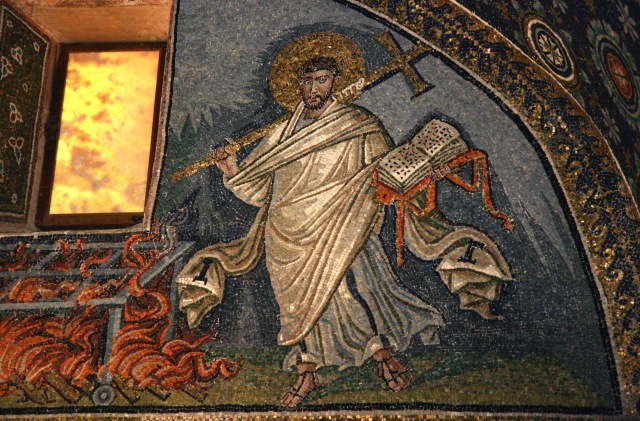 There is a very nice example among the mosaics in the Mausoleum of Galla Placidia in Ravenna (5th century AD), where one can see Saint Lawrence going towards the grill with a dancing skip. Actually, the legend says that he made a cheerful remark in the middle of his suffer, saying to the torturers: “I’m well done on this side. Turn me over!”. So I hope you will think about Saint Lawrence for a moment next time you will be turning over whatever you roast on your grills.